Do you know that a cast iron skillet can be an alternative to the stainless steel tri-ply skillet at a fraction of the cost? When seasoned and cared for, it can also double as a non-stick cookware. Furthermore, unlike Teflon-coated pans, cast iron remains safe past 500 degrees -- it can even go under the broiler. And while non-stick skillets can live for three to five years (depending on usage), your beloved cast iron cookware can still be handed down to your children. Still not convinced yet? Do read more about its benefits below. Teflon-coated pans may seem like the best there is when it comes to non-stick cookware. But associated with using it are health risks. For instance, when a dry Teflon-coated cookware is heated to high temperatures, they release chemicals called perfluorinated compounds or PFCs into the air. These compounds, when taken into the system, can impair the liver, brain, and hormone balance. Scratched non-stick pans release even concentrated PCFs into the food. Looking at the brighter side of things, cast iron skillets becomes naturally non-stick when seasoned properly (very important). Since it’s non-stick, you can cook food with less oil – perfect for people trying to eat healthy. To know how to season your cast iron the right way, refer to the video below. Apart from being nearly indestructible, cast iron cookware are noticeably heavier than similarly-sized pans and pots. Their weight is part of their functionality -- it allows the cookware to retain heat longer. Whether you’re searing steak or simmering stew, trust that the heating will be consistent all throughout. The best part is, if you served your curated dish in the skillet itself, it would likely remain warm for the entire dinner. Sounds like a good deal? Some find it difficult to clean cast iron so here’s a quick and easy solution – empty the pan once your food is cooked. While it’s still hot, run water over it while scraping off bits and pieces with a metal spoon or spatula. Lastly, dry it with a paper towel dipped in olive oil or something and keep it for storage. For other tricks on cleaning cast iron, check out this video below. No cookware can ever fortify food except the humble cast iron. When heated, the iron element leaches from the cast iron into your food. In fact, daily cooking using a cast iron helps provide the 18 mg of iron adult women need every day. It's also ideal for people who suffering from iron deficiency as it’s a direct and easy way of acquiring the element. It can also aid in the increased iron requirement of menstruating and pregnant women. When buying out your first cast iron cookware, of course, you’ll stick to a new one. But since cast iron is nearly indestructible, vintage cast iron is just as usable as newer ones. A major downside of choosing vintage cast iron is that the condition and appearance can vary drastically. Some sellers take the time to properly season and clean their cast iron while others choose the easy way out by painting stuck food pieces over – gross! If you’re eyeing a new one, renowned cookware brands such as Wagner and Lodge, Le Creuset, Husqvarna, Staub, Lodge, etc. 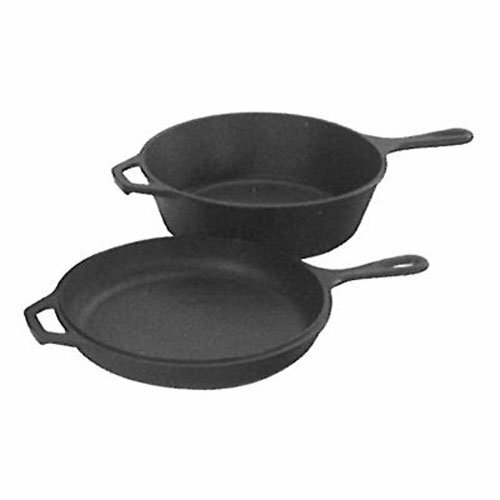 offer a variety of high-quality cast iron cookware. We bet the first thing that comes into your minds when you hear the word cast iron are skillets and pans. There are a variety of cookware as well as baking products made of cast iron. Since it’s good at heat distribution as well as possessing a non-stick surface, cast iron makes excellent baking tools. Other cast iron cookware includes griddles, roasting pan, saucepan, casserole pan, Dutch oven, wok, steamer, baking pan, baking tray, and muffin pans. For first time cast iron buyers, I suggest choosing a starter skillet because it’s versatile and one of the widely available types. After deciding what type of cast iron you need, you now have to choose whether you want a coated (enameled) or uncoated cookware. Either coated or uncoated, cast iron cookware needs to be seasoned. You can also opt for a pre-seasoned one. A coated cast iron is covered with enamel, allowing the user to clean the product with soap for easier cleaning compared to an uncoated one which only needs to be wiped with an oiled cloth to preserve the seasoning. However, enameled cast iron are prone to chipping and aren’t as enduring as uncoated ones when subjected to open flames. On the other hand, though it’s a bit hard to keep up with cleaning an uncoated cast iron, there are some perks for choosing this type. First, its bare surface allows iron to transfer into the food for fortification. Also, it’s safe to use this when cooking on open fires. The only downside to uncoated cast iron is that the iron can react with acidic foods, making them taste odd. When shopping for cast iron cookware, take note of the bulleted list below. Ideally, the cookware (including the handle) should be made out of a solid piece of cast iron instead of wood or steel. If possible, choose a cookware with cast iron lid because it’s oven-safe and can be used on an open flame setting. ​All cast iron cookware are heavy. If weight is an issue to you, choose the smallest size that suits your needs. Some cast iron are made of thicker material than others. They are pretty heavy, but they retain and distribute heat better. This cast iron skillet is all you could ever need in a starter skillet. Sear, sauté, bake, broil, braise, fry or grill – name it, this skillet can handle the job. You can even put this baby in the oven or over the campfire. This pre-seasoned skillet is ready-to-use right out of the box! It’s been seasoned using vegetable oil that penetrated deeply into the pores of the iron, creating a sleek finish. This virtually indestructible cookware features exceptional heat retention (just the right thickness), generous size (12”), two handles for heavy lifting (one long and one short), two subtle side lips for pouring, and silicone-coated cast iron handle for no-burn handling. We absolutely loved this skillet, but one thing worth noting with this product is it is induction cooktop-compatible. Well, that’s something because nowadays, it’s hard to find a standalone cookware that suits various cooking surfaces. Fry up catfish, roast a chicken, or bake an apple crisp using this multifunctional 10.25-inch skillet. It retains heat well so you can sear meat at higher temperatures and keep your meals warm for a long time. Similar to our first entry, this multifunctional skillet is made of premium cast iron, has excellent heat retention, and is pre-seasoned. 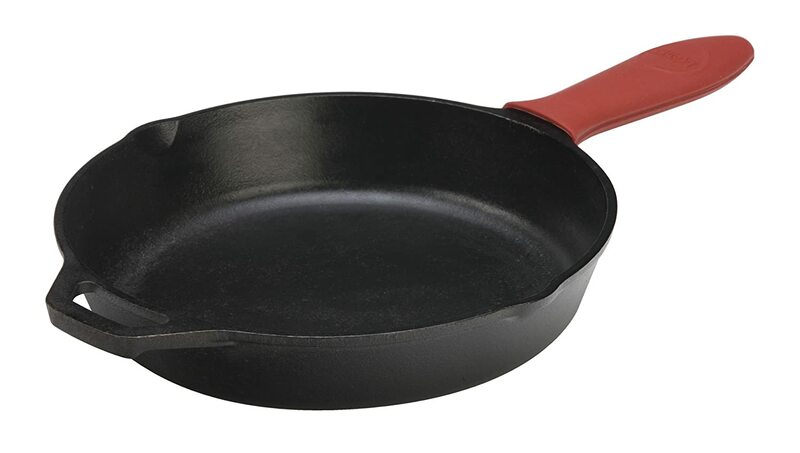 This skillet which measures 10.25”, is very reliable for various cooking methods. It also features a helper handle that aids in lifting, a looped primary handle for hanging, and two side spouts for pouring off grease or juice. 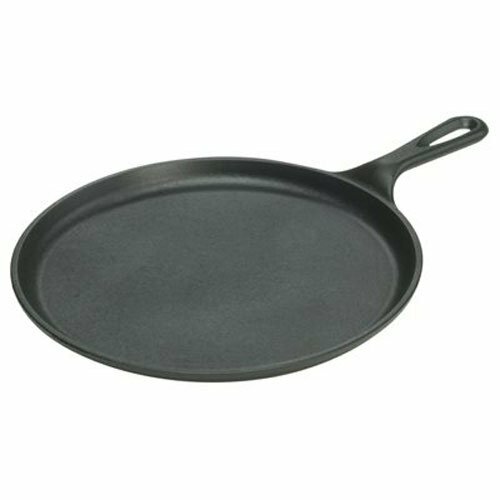 Furthermore, this skillet may be used on various heat sources including gas, electric, open flame, induction and ceramic-glass top stoves, and ovens. We must admit that we’re amazed by the quality of this skillet. We tried it for baking corn bread, and the result was nothing short of spectacular -- the bread came out nice, brown, and moist. The skillet retained heat so well (especially the sides) that the bread was evenly cooked through. If you’re into cooking big family breakfasts, tortillas, quesadillas, crepes, and anything grilled, the Lodge Cast Iron Griddle will wonderfully cook all your favorite foods without scorching. This griddle loves the campfire, stovetop, oven, and slow cookers. It retains heat excellently and will surely last for generations. Sporting a stylish black color, the cast iron cookware will definitely hang beautifully in your kitchen. This thin griddle also features a holed handle for hanging and is oven-safe up to 500 degrees F.
We opted for this griddle instead of antique griddles just because it can't be beaten. It’s heavy, making the pan stay still even when you’re placing or removing food items from it. And because I'm often multitasking, I kind of like the idea that I don't have to hold the handle because it doesn't budge. It just sits there and does the things it's supposed to do. The pre-seasoned Lodge Cast Iron Square Grill Pan will be your new indoor grilling friend. From steaks and vegetables to paninis, this grill pan will help you create your best grilled recipe yet. Aside from having superior heat retention, durable handles, and cooking versatility, the standout feature of this pan is the ribbed bottom. The ribs of this pan are ideal for low-fat cooking because it allows fat to drain from food while simultaneously searing grill marks onto meats, paninis, and other grilled dishes. The only thing that may draw you back from buying this cookware is the ease of cleaning. You probably think that it’s hard to clean because of the ribbed bottom. Don’t be bothered because it’s real easy to clean – simply run water whether over the warm pan and clean with a sponge or stiff brush. For any stubborn food pieces, sprinkle kosher salt or baking soda and pour boiling water. Voila! Cleaning this pan isn’t as hard as you think. Ideal size; fits whole chicken, steaks, etc. The combo cooker includes a versatile 3.2-Qt. Dutch oven and 10.25-inch shallow skillet (that doubles as the lid). Imagine how useful it is to own a combo cookware that even has a convertible cover – what a money saver! This cookware is a 3-in-1 product -- a deep skillet, a fryer, and a Dutch oven. 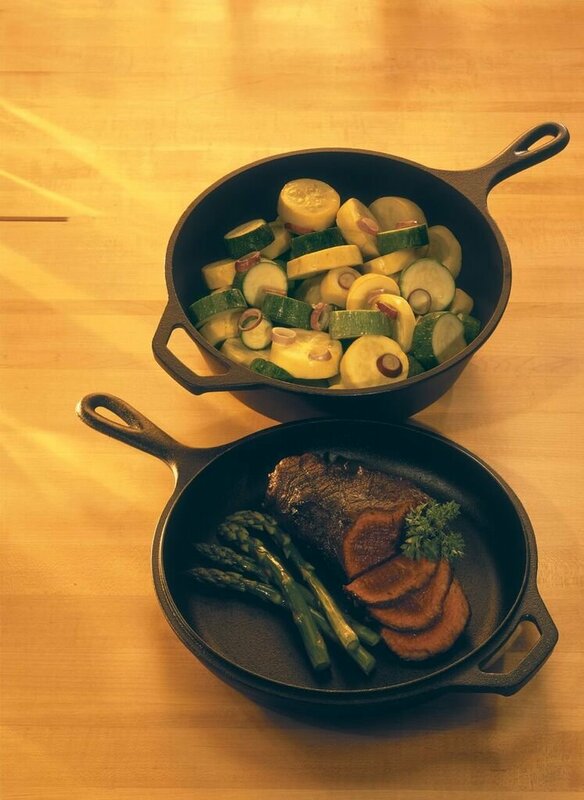 The Lodge Combo Cooker is a versatile piece of cast iron cookware that allows the preparation of almost any recipe. Both Dutch oven and lid are seasoned and ready to use and feature both helper and long handles as well as pouring spouts. We’re fans of hybrid cookwares because they’re unique, affordable, and very versatile. When it came to our doorstep, we’re already expecting what it would look and feel like -- heavy, uneven in color/pre seasoning application, and rough like sandpaper. We cooked our breakfast using this cookware, and we’re satisfied with the results. First, it kept food warm for more than an hour, the food tasted better (possibly due to iron leaching), and they’re a breeze to clean. The only thing we disliked about this product is it’s too heavy like you need to use both hands to move them which is unusual for cast iron products. We chose the best cast iron cookware according to the following general criteria: degree of versatility, size, weight, ease of cleaning, and suitability for use in various cooktop surfaces. 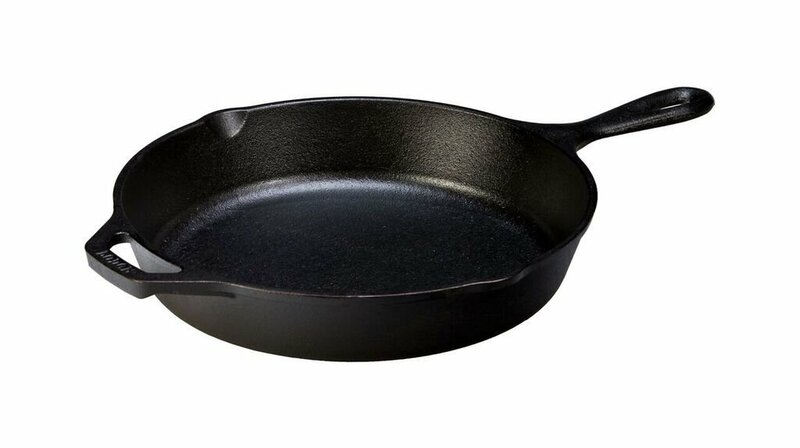 The only one in our list possessing qualities that have met the criteria was the Lodge Cast Iron Skillet with Silicone Holder. Aside from meeting the said requirements, this cast iron cookware is pre-seasoned, induction cooktop-compatible, and has a silicone-coated handle for safe handling. Hey there! Do you own any cast iron cookware? Is it similar to any of the five we’ve listed? Do you think we missed out on some great stuff? Don’t hesitate to comment your thoughts below. And one more thing, do share this post. Cheers!